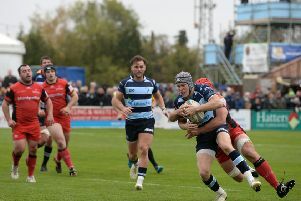 Bedford Blues began their Championship season with a 26-17 defeat to Cornish Pirates at Goldington Road on Saturday. The Blues struggled all afternoon against their opponents who powered to victory, with tries from Dean Adamson and Jason Hill not enough for Mike Rayer’s side. Playing down the slope, Bedford made early inroads but couldn’t find a way through despite good runs by Tom Griffiths and Elliot Clements-Hill. Justin Blanchet was stretchered off injured, before Will Cargill kicked Pirates in front on 21 minutes. Blues hit back quickly though when Jake Sharp intercepted and collected his own kick to put Adamson over, with Sharp easily converting. Pirates retook the lead almost immediately though when Matt Evans touched down, Cargill adding the extras, before Sharp’s penalty drew Blues level at 10-10. The visitors were back in front, Duncan dotting down and Cargill converting, while his penalty made it 20-10 at the break. In the second period, Cargill extended Pirates’ advantage to 23-10 with a 65th-minute penalty, but Blues had a sniff when Jason Hill powered over with sub Myles Dorrian converting. They were almost level as Josh Buggea broke and found Perkins, only for a strong tackle forced him to spill the ball. They were made to pay with three minutes to go with Cargill’s boot adding another penalty as Blues couldn’t come back. Bedford are away to Jersey Reds this weekend. Blues: Elliot Clements-Hill, George Perkins, Michael Le Bourgeois (C), Tom Griffiths, Dean Adamson, Jake Sharp (Myles Dorrian 67), Jordan Burns (Tom James 61), Camilo Parilli-Ocampo (Hayden Thompson-Stringer 50), Jacob Fields (George Edgson 61), Christian Judge (Dave Spelman 50), Mike Howard (Ed Taylor 67), Will Carrick-Smith, Justin Blanchet (Jason Hill 11), Josh Buggea, Ben Adams. T: Adamson, Hill. C: Sharp, Dorrian. P: Sharp. Pirates: Toby May, Kyle Moyle, Nicolas De Battista (Thomas Gilbert-Hendrickson 56), Alex Dancer, Matt Evans, Will Cargill, Alex Day (Stuart Townsend 56), Marlen Walker, Jack Innard (Tom Channon 61), Tyler Gendall (Jack Andrew 61), Chris Morgan (C), Brett Beukeboom, Dan Lee (Jake Parker 80), Alex Cheesman (Sam Simmonds 71), Tom Duncan. Replacements not used: Laurence May. T: Evans, Duncan. C: Cargill 2 P: Cargill 4.